Its been almost three years since I have added a post to the site. I can’t believe time has flown like it has. I really dropped out of most social media during that time as I entered a very busy stage of life. In the last three years, I have changed jobs, had twins, learned some new programming languages, and become a lot more stressed than I was. 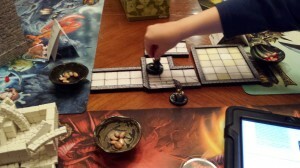 One thing that hasn’t changed though, is the fact that I am still playing games with my kids. We play everything from video games to board games and D&D together. 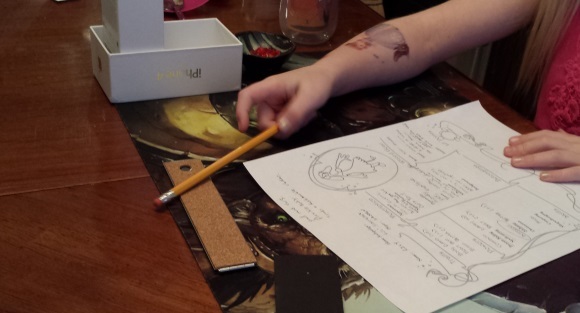 I have a ton of fun introducing my kids to new games and increasing the complexity of the D&D that we play to see how they handle new problems. 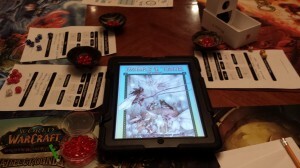 I am going to try to start posting more frequently again to talk about playing games, playing games with my kids, programming, and maybe even some more of my wife’s art. See you soon. Guess what?! 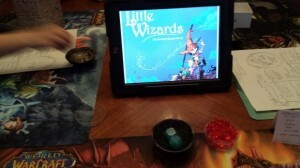 It is teach your kids to game week this week and I have taken the opportunity to buy some of the titles that are discounted at DriveThruRPG (and some that are not) in order to play more with my kids. Anyone that knows me is already aware that I game with my kids. I’ve made up a simple game that uses fate dice and talents to play with my kids many times before that they lovingly call “The Adventure Game.” They have even had friends over to play this with them before and great times have been had by all. Someday, I might have to write the rules down and see if anyone else is interested. There are a few more that I might have to buy, like Camp Myth (also not on sale) and rpgKids, but I’m not sure if I should right now. Why did I buy all these games? 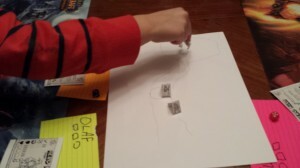 My goal is to play a game each night with my kids using a different game system and see which ones they like. Hopefully, they will like all of them, but maybe one or two stand out as their favorites. I just want to take advantage of the week and teach them as many games as I can. I’m also slightly interested to see how my own adventure game stands up to these games. I am a blessed dad. I have five wonderful children. The last two are twin boys that are only a month and a half old, so they will not be joining us for this week of gaming. My other children are Lauren who is 7, Logan who is 5, and Levi who is 3. Most of the games I bough have a lower age of either 5 or 7, so it will be interesting to see if I can keep the younger two engaged. 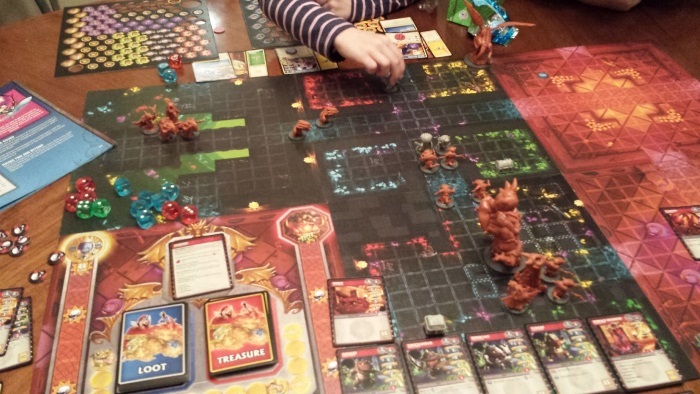 The first game I started with last night was Hero Kids. I had heard many good things about it and was anxious to give it a try. 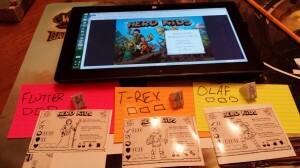 Playing Hero Kids with my three older kids! 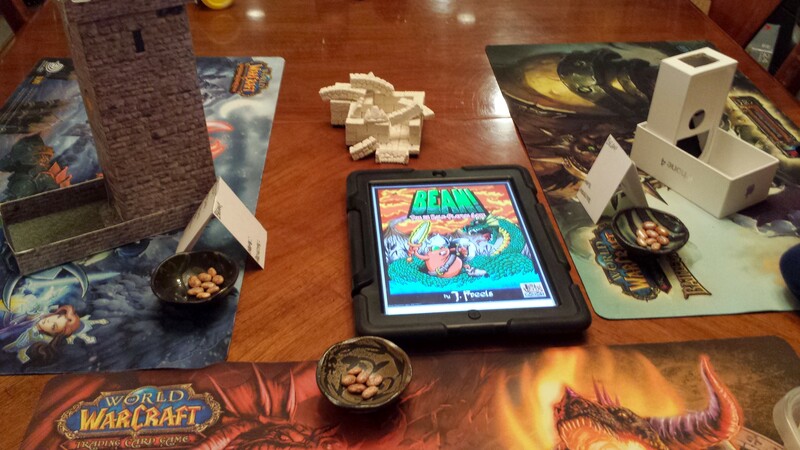 The kids joined me excited around the table. My printer had stopped working with regular paper, so I had to make the character cards that came with the game fit onto 4×6 photo paper. 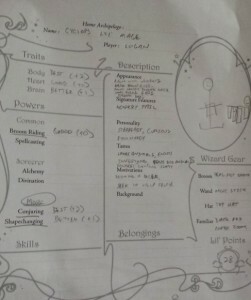 So after fixing dinner and then manipulating the pictures using Paint.net, I finally had character sheets printed out for them and ready to go. Because of all this, the kids knew they were going to get to stay up past bedtime to get to play, needless to say, they were doubly excited. 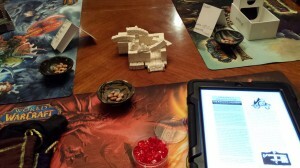 I used the basic characters that came with the base game and had them all printed out. 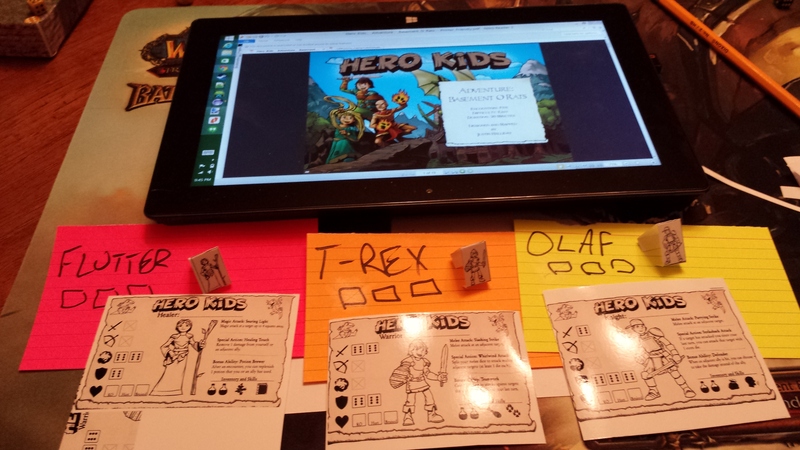 I let them choose their hero, Lauren chose the healer and named her Flutter, Logan chose the warrior and named him T-Rex, and Levi chose the knight and named him Olaf. I set out two dice towers and handed out several mini d6’s that the game uses for resolution. I told the kids about their characters and how they are kids who have trained to be heroes from birth. 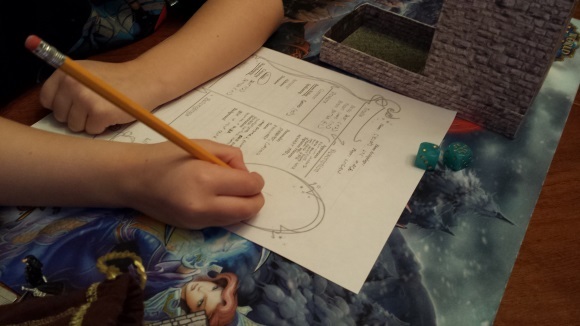 I explained that they can uses the abilities that they have on their sheets with dice next to them, and that they roll the number of dice next to them when they use that skill and use the highest number that they get out of all the dice. Lauren and Logan understood this but Levi was just wanting to roll dice. 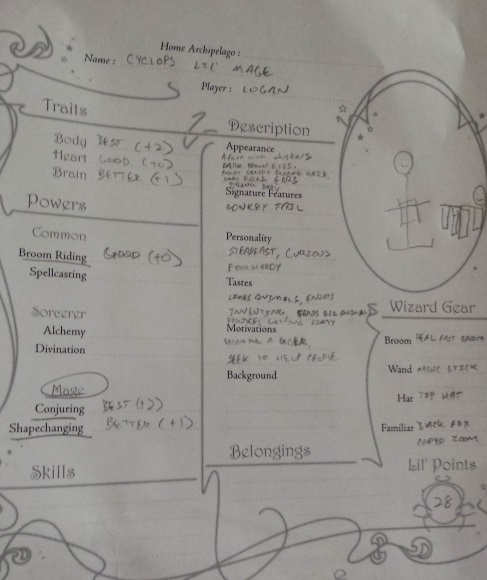 I then explained that they each have a special action, ability, skills, and an inventory listed on their sheets and took a minute to go over them as well as the three hit boxes that they have listed. After this short amount of explanation, we started with the adventure. Here we used the provided adventure Basement O Rats. Their characters were all siblings and eating with their family in the local inn when the owner came up out of the basement screaming about giant rats taking over the basement and taking her son! The parents looked at Flutter, T-Rex, and Olaf and asked them if they were ready to start on their first adventure, they gathered their gear and said yes! 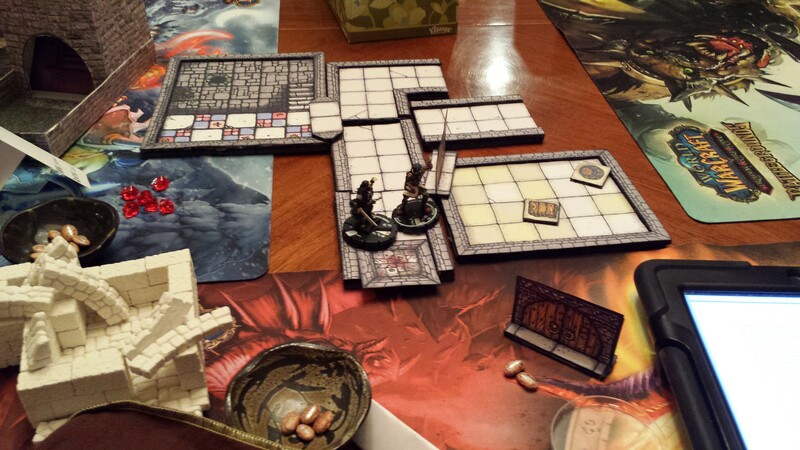 I set down the basement and set up the bad guys (using zombie figures instead of rats but they knew they were rats) and but their characters at the top of the stairs. 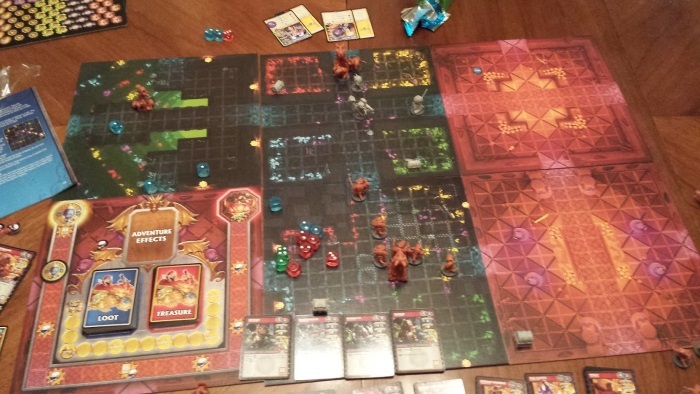 I explained that they could move 4 spaces each turn and take one action, be it attacking or healing or something else. I also explained that the healer could attack 4 spaces away while the warrior and knight needed to get up close the action. 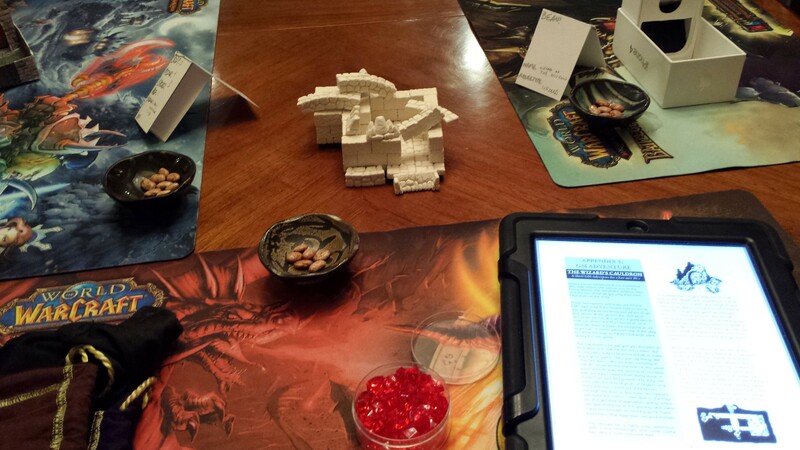 We rolled initiative and we were off! 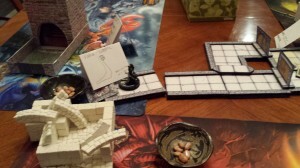 Olaf and T-Rex both jump into basement and slice up two more rats. 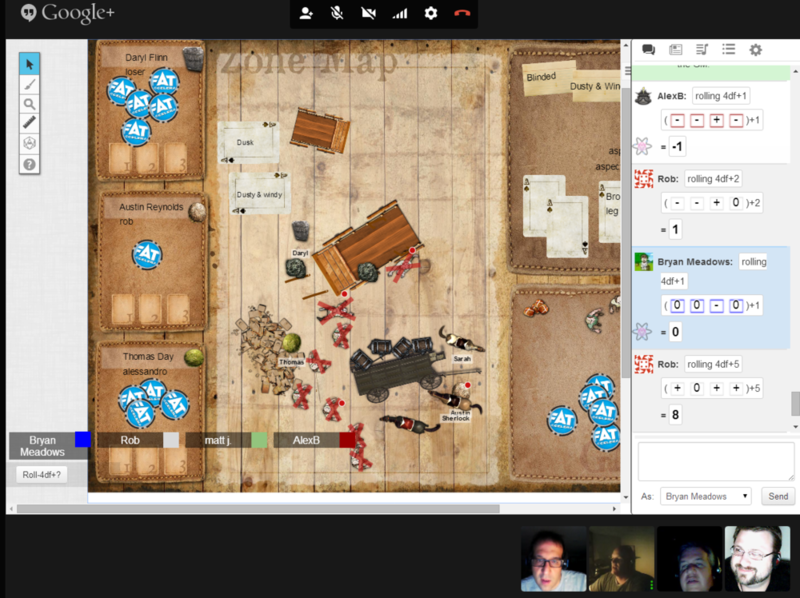 Then the rats attack, teaming up on T-Rex and Olaf to deal one damage two each of them! (They looked pretty concerned, but I explained that sister could heal them instead of attacking if she wanted.) Of course, Flutter chose to attack instead, this time opening a portal to bat world and summoning some bats to attack then fly back through the portal. With another rat down, there were only 3 left. T-Rex misses when he attacks with the rat jumping out away from his sword, but Olaf bashes one over the head with his shield, crushing the beast. The rats attack but their teeth and claws bounce harmlessly off of the boys’ armor. Flutter tosses a ball of plants at one of the rats that cause him to scratch himself to death, while T-Rex dispatches the other one with the blunt side of his blade. (The kids are describing how they do all of this by the way, sometimes I prompt them with questions, but they are good at it.) Having dispatched all the rats, Flutter quickly heals her brothers and they hear shouts coming from a hole in the basement and they decide to descend into the rat lair. Dropping into the hole they see it goes into two directions. I ask them which direction they think they should go and I hint that one of them has an ability that might help. Lauren runs around the table and whispers into Logan’s ear. He looks at his character sheet and shouts that the wants to track the rats! Using his ability, he knows which direction they went and they head off! After taking these rats out, Flutter heals T-Rex’s bite and they head on through the tunnels. They find a wall that they have to climb up, but none of them have any rope. Lauren asks if she can use her magic to get them up the wall. I say that is fine and ask her how she wants to do it and that she must roll for it. She says she wants to summon a magic ladder that attaches to the wall with super glue that will let them climb up. She rolls and gets a success so a magic ladders made of stone grows out the ground and they climb up it. At the top, they find 3 gems, one for each of them that they save for later, and passageway leading to another room. And with that, I sent them to go brush their teeth and get ready for bed as I cleaned up. We had a great time and I did like the system. I would also give the game Hero Kids 5 stars. 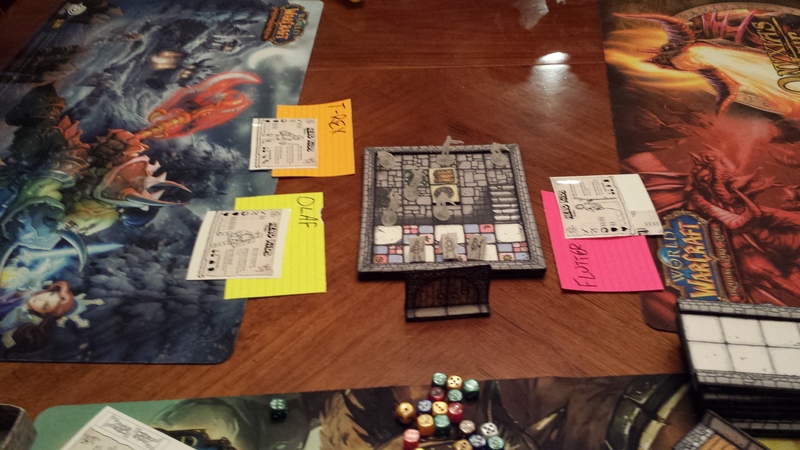 It was a great night of playing and we will definitely play this game again. Tonight we play Faery’s Tale! Cya then! So my buddy Matt has decided to run and old school game using Pits & Perils. I think we will be playing this Thursday so I went ahead and rolled up two characters to help me decide what to play. The first was a thief and the second is an Elf. Both characters look fun, but I think I’m going to have to go with the Elf. I like the idea of a spell and spear welding character. 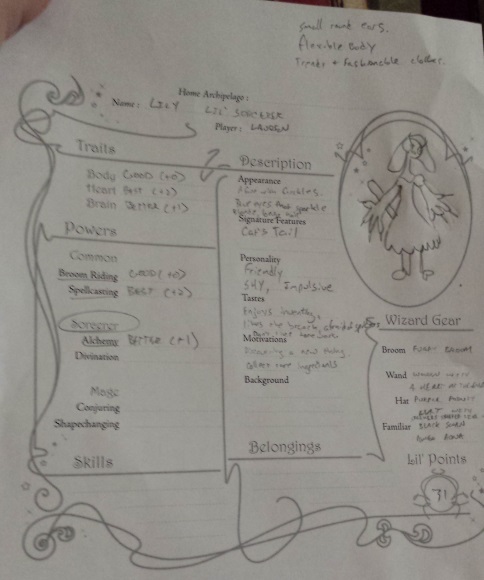 Matt did just release some house rules for a Halfling and bard class too though, so I might have to roll up two more characters to see how they look. So I am mainly a Java programmer, but I have decided to give Unity a try. Mainly because I feel like I can bring things to completion faster if I use Unity. One of the biggest things that led me to this decision was the Ludum Dare. People were able to get really neat and we’ll received games in Unity. I have not given up on my game programming in Java, but I feel like I can do some really rapid prototyping in Unity.